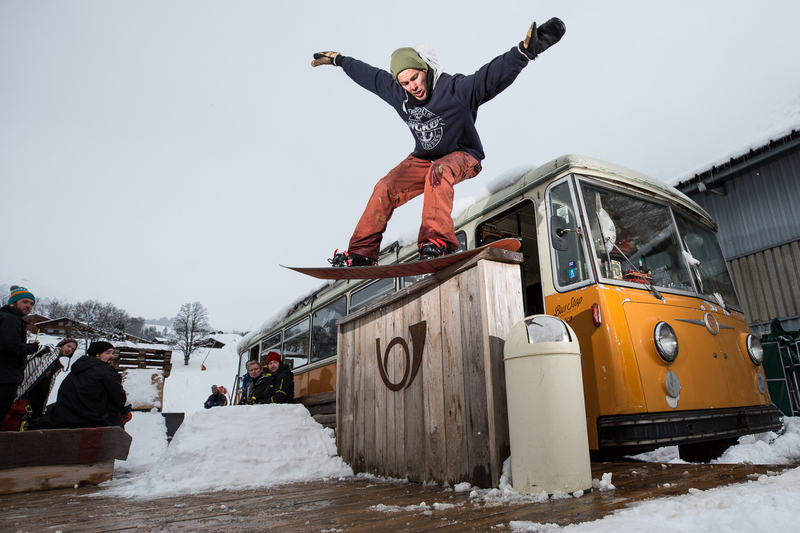 Switzerland isn’t exactly known for it’s street spots, but there’s plenty to do when it snows down low if you’ve got full batteries, and a good eye for spots. 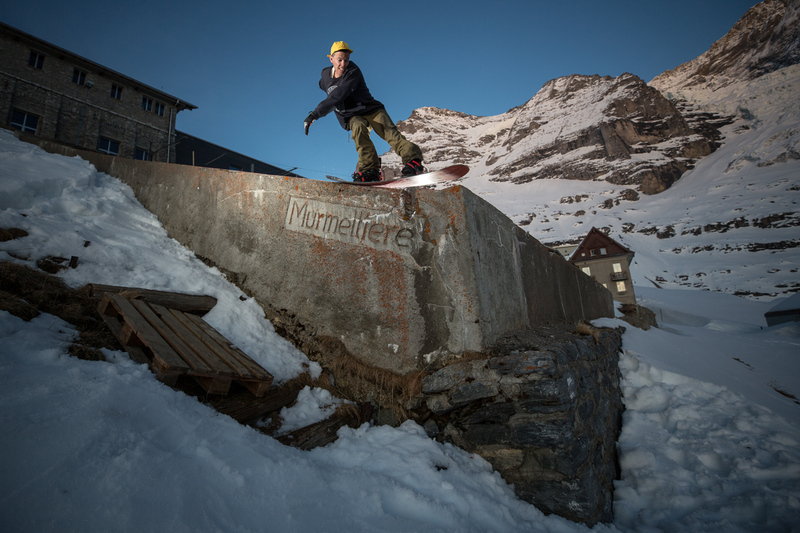 We already knew that Kuno Egli and Florian «Mühli» Mühlemann have plenty of creativity, but we were still impressed by the number of shots that they stacked in Grindelwald — a zone that’s much better known for it’s park and pow. We know from experience, that when it comes to shooting street, nothing ever comes easy. If you’ve got a flash, a generator and a winch in the mix, you can pretty much guarantee that one of those things will not be working when it matters most. And don’t even get us started on the nosey neighbors who think they own every dumpster in town. This is from the first spot that we hit and it turned out to be Mühli’s favorite shot. The build didn’t take long, but getting the ice off the concrete was a lot of work. But now that I look at the final picture, I’m glad that we put in the effort to make this detail look good. After we had hit spot numero uno, Mühli had to put in a few hours of work. 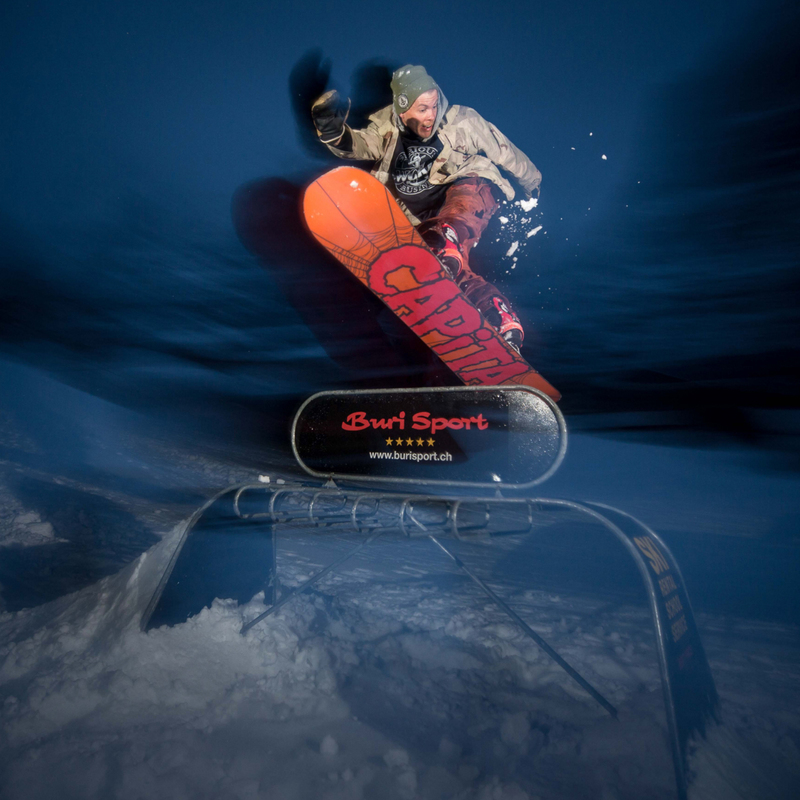 But when it got dark, it was time to hit our first night spot. A friend provided lights and a winch. Shortly after the session started, the lights died and we were only able to keep them running for a few more minutes. Given the limited amount of tries that Mühli had, I’d say the result is OK. Looking back, hitting two spots the same day was maybe a bit too much. To my surprise, all our sessions so far had gone down smoothly. No one was complaining and no super citizens showed up to shut us down. At this stop however we were even invited by Erlend, the friendly owner of the Busstop Bar, to session the bar’s counter. As you can see in the picture, I wasn’t the only one pointing a camera at Mühli, but he handled the pressure like a true champ. Stop by the Busstop next time you’re in Grindelwald and have a drink. You might not be able to session the bar, but it is THE apres spot in Grindelwald. This was anther day, where one spot wasn’t enough. After the Busstop had closed its doors, we started shooting this ski rack. Looking a little closer, you can spot an ad from the sports store of a well-known family from Grindelwald. Now don’t you think a Club Haus ad would be a better fit Max? I was really happy when I noticed all the colors of these skips and tried some artsy-fartsy stuff. I’m quite happy how this one turned out. Ah, this spot on that particular day… Sometimes all of the factors align. I got my favorite shot of last season out of this session. Yeah, the colors in the sky are nice, (some might say cheesy) but as you can imagine, it was pitch dark when we finished the session. Having to master more than 1’000 meters of altitude to get back to town, equipped with only the flash light on my iPhone, all while carrying two heavy backpacks was quite a task. I was completely exhausted after this descent, but knowing that I had this shot made it all worthwhile.